What makes the ReVoicer different from a typical Vocoder? It is a Stereo Spectrum filter-bank Vocoder with an Internal Oscillator that can work as Oscillator Instrument, or Internal Carrier to synthesise vocoder sound. The External Carrier stereo inputs can be used, or use/mix the Internal oscillator (which includes basic waveforms such as Pulse, Saw, Tri, Sub and Noise), to vocode the Modulator inputs. The Internal Oscillator can also be used as a simple Oscillator (it can be processed by the Vocoder) and as part of a vocoder (internal carrier) for fast results without the need to create any external Carrier device in Reason’s rack. ReVoicer is a modern stereo Vocoder with internal oscillator, limiter and spectrum frequency control. It allows for a lot of vocoder variations in order to create unique Vocoder textures for any vocal or instrument sound. ReVoicer comes with a variety of patches including 70+ Combi vocoder FX patches. Think about Vocoder? 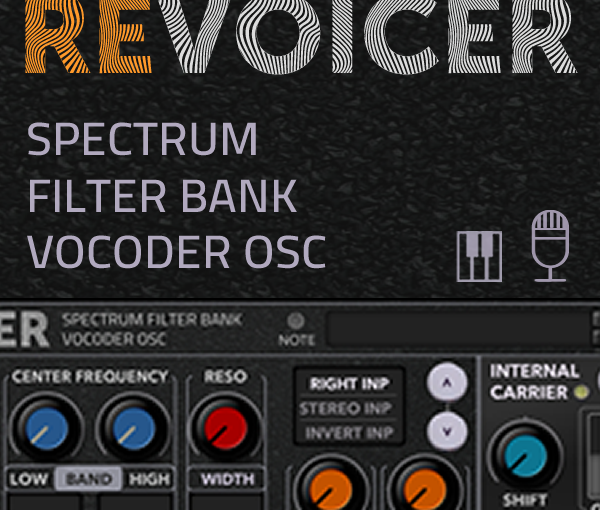 Try today ocean of Vocoder textures with ReVoicer.